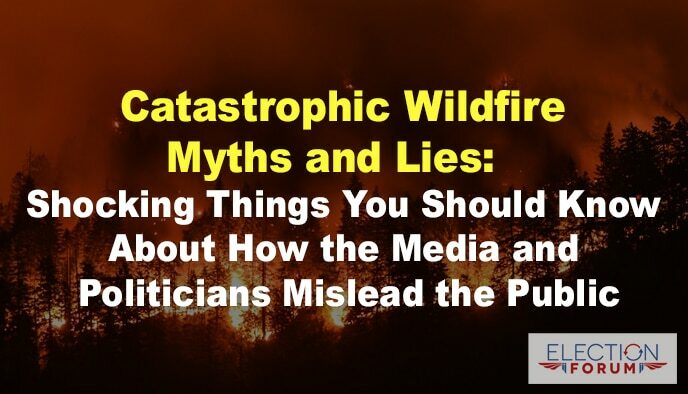 But the Deep State bureaucrats, progressive politicians and the biased media are misleading the public about what’s causing so many wildfires to become so large so quickly. In fact, in California, Governor Jerry Brown warns residents they’d better get used to massive wildfires every year as the “new normal” – caused by climate change. But that’s just not true. It’s a big lie. Wildfires are spreading more rapidly and burning larger areas because of poor forest management … not because of global warming. Forests that are under state and national ownership are catastrophically overgrown … often having 4 times the number of trees per acre the land can support. For example, in the Stanislaus National Forest – the location of a massive wildfire this year– the tree density is about 300 trees per acre according to the fire officials battling that blaze. There is no scientific evidence that wildfires are caused by “climate change” or global warming. For one thing, hot, dry weather can’t produce the spark or flame that’s necessary to start a fire. Second, if wildfires were being caused by global “climate change” we should expect the burned acreage worldwide to be increasing each year. Third, it’s also worth noting that if climate change were to blame for wildfires, private lands would be impacted to the same extent as public lands. This report should be sent to all the Republican candidates for the next election so they can propose to take action against forest fires in California. I agree with genibre. This should be put on the election polls leaving them without an excuse to manage the forest. It is many ways the government can go about this and even create jobs by it. It will benefit everyone.